The barrel piano, called the ‘bastringue’ in French, the instrument symbolic of simple entertainment so often found in popular gathering places (cafés, bars, saloons, and dance halls) at the end of the 19th and beginning of the 20th century. Their legacy is a nostalgia for that ‘belle epoque’. France produced many prestigious pianos such as Jules Piano, Joseph Nallino, Amelotti, etc.. Many of these were destroyed after the 1930’s with the arrival of radios and record players. To find one of these instruments, restore it, tune it and finally, to listen to it is a real pleasure as it brings us live the popular airs of the ‘belle epoque’. There are two types of player pianos. The most common one is the Aeolian system guided by a harmonium type pedal turning a perforated roll of paper to read the notes and produce air. The second, more elaborate piano, is the expressive piano reproducer equipped with electric motors to produce air and to turn the perforated paper roll. The major brands are Ampico, Welte and Duo Art. The invention of these systems was a technical achievement both in the registration of the music as well as the reproduction of the music. 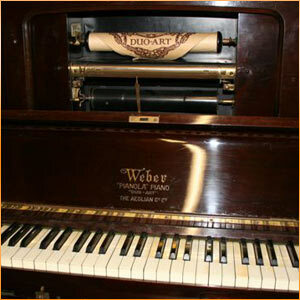 Artists such as Debussy, Prokofiev, Gershwin, Rubinstein and others registered their music on these types of pianos. To listen to these pieces on a reproducer piano allows us the immense privilege of assisting a private concert by the artist as these instruments reproduce the technique and nuances actually played by the artists. These systems were mounted on excellent quality pianos like Steinway, Pleyel and even Yamaha.